A split, a disconnection and a fracture pull apart the lives of a family. Lies, secrets and memory pull the reader along through the rapid currents of this beautifully written novel. Written in the less ventured second person narrative, the story is narrated by Andrew and his mother, yet it would be wiser to point out that it has in fact been narrated by four people; a young Andrew and young mother as well as Andrew as a man and his mother who is nameless until the very end, as an older woman. 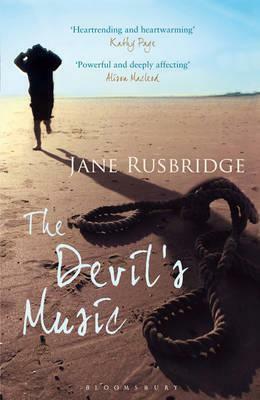 The Devil’s Music is a dark story, one which plunges the reader into a story of betrayal, fragmented memory and knots. Memory and the reliability of it plays an important role in the unraveling of this story and the lives of this seemingly normal family of five. Andrew had left home, hoping to evade all the ghosts of his past, but he has returned after his father’s death and with his return to the beach home his mother had always loved, so do his ghosts, whispering in howling wind and crashing waves. From the very first sentence, we are swayed and knocked with the tumultuous language of the sea. Rusbridge’s atmospheric depiction of coastal life gushes off the page exposing gulfs as they wash over the reader who is hit by one tsunami wave after another. From the offset there is a sense of calm intermingled with urgency; both tug at the reader simultaneously in opposing directions. This impression is immediate and it’s only a matter of minutes before this assumption becomes clarified. Andrew has an obsession with knots, the different kinds with multiple functions, something his grandfather taught him for he was a rope maker. His hands are in constant motion, longing to tie or untie, the importance of knots in Andrew’s life become clear on page nine; “The dip and curve of the strands is thick as muscle. This is what gives rope its strength, the laying together of strands which have been twisted in opposite directions. Rope is bound together by the function of its part.” The reader is hooked in as they try to imagine Andrew’s life untangled, for there are times when he seems to flinch so hard that he only becomes further knotted. Characters and the elements are brought to life seamlessly by Rusbridge’s rippling and quivering poetry- poetry of the wild. Andrew’s mother is a bound woman; she is bound to her home as a mother, a homemaker and a wife of a well established doctor, she can not afford to do no wrong. Andrew at times seems to be like a cold polished pebble- only reflective- never truly there absorbing anything, yet, it could be the absolute opposite. Andrew who is locked in the past with his younger sister, the one who was classed as “not really being there” a classic example of medical terminology in the 60s, in fact absorbs everything, every word, colour and taste to the point of over spilling. Andrew can not absorb any more of life until he can understand what really happened in his past, and the past that had once belonged to his family. The beauty of this story is not only the striking imagery cast by Rusbridge but her ability to be a wonderful storyteller, she truly captures the readers mind and refuses to let go, even at the bitter end.